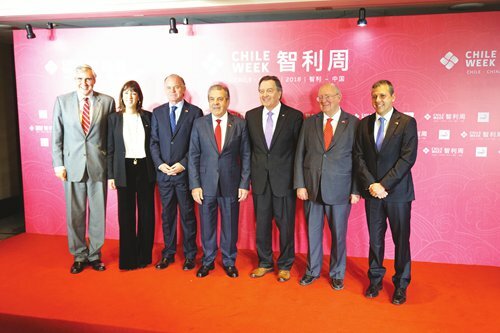 At the recent Chile Week that lasted from November 1 to 9, the Chilean government has sent a delegation comprising of top government officials to China to promote Chilean products and services and open up dialogues over greater potential for collaboration between China and Chile. Every year, Chile Week is a special occasion for people in China to better understand Chile. This time, the event came with a greater scale of delegation and events. The visiting officials included former Chilean president and Plenipotentiary Ambassador of Chile to the Asia Pacific Eduardo Frei Ruiz-Tagle, Chilean Foreign Minister Roberto Ampuero Espinoza, Chilean Agriculture Minister Antonio Walker Prieto, Chilean Minister of Public Works Juán Andrés Fontaine Talavera, Chilean Vice Minister of Trade Rodrigo Yañez, Vice Secretary General of Tourism Mónica Beatriz Zalaquett Said, Director of Invest Chile Cristian Rodríguez, and Director of ProChile Jorge Eduardo O'Ryan Schütz. The Global Times sat with Eduardo Frei Ruiz-Tagle, Roberto Ampuero Espinoz and Luis Schmidt Montes who shared with us their perspectives over China and its special relations with Chile. Chile is a small country with a population of over 18 million. It is important for us to find our balance in the disputes of large economies. We must abide by the rules and agreements over multilateralism. Otherwise, we cannot protect ourselves as a small nation. We are doing pretty well on this. For example, we have very good trade relations with countries like China. Although many believe that with the backdrop of the trade friction between the US and China, the trade volume between China and Chile will not rise, but it does. China's reform and opening-up has been very successful in the past 40 years, escalating China to the second largest world economy, and will likely become the largest within a decade. I also think that the urbanization and the reduction of poverty are impressive. China brought 800 million people out of poverty, which is a great achievement. China's development is very beneficial to Chile. We export food and wine to China and we have much cooperation with China in astronomy and optical fiber. China's investment in Chile plays a very important role. We have offered many franchise rights to Chinese enterprises in China. China is our largest trading partner and our relations with China need to be further strengthened. China and Chile agreed on promoting and defending free trade and multilateralism. We are on a very good level of understanding and articulating our positions with other countries that share the same view. We are a very open economy and we have based our economy on free trade for the last 40 years. In China, we have a very positive situation, because we have achieved a lot in China and our exports to China are growing every year. China has become our most important trade partner and we are very happy with this development. We see during the meetings we have had with Chinese authorities that there is huge room for deepening our relations. So we are very confident that the future would look much better. That's why we are also here in China with a delegation attending the Shanghai Expo and the Chile Week to deepen our relations as a possible answer to the trade tensions. I remember when I stayed in my first year as the Chilean Ambassador to China when China changed its government from president Hu Jintao to President Xi Jinping. President Xi Jinping said immediately that China needs to transform itself into an important player in the world. For this reason, all the investment in high technology and innovation is put in focus. And today, you are the biggest supplier not just in clothes or shoes, but in technology such as computers, cellphones, and high-speed trains. For the same reasons, in Chile, we still need to learn what progress you have made in innovation and technology. We want to deepen our relations in the scientific field, especially in Antarctic research and astronomy.